It appears, pyramids there are even on island Mauritius which is in Indian ocean, almost one thousand kilometres to the east from Madagascar. 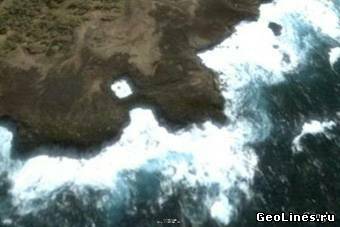 The most nteresting in these pyramids that they are located on a small islet of volcanic origin mislaid in the boundless ocean spaces but that they are almost exact copy of Guimar pyramids,which are placed with another side of Africa, on an island Tenerife. Pyramids are very similar both outwardly and by manufacturing way and it gives all bases to assume that constructions on both islands is the result of activity of the same builders. 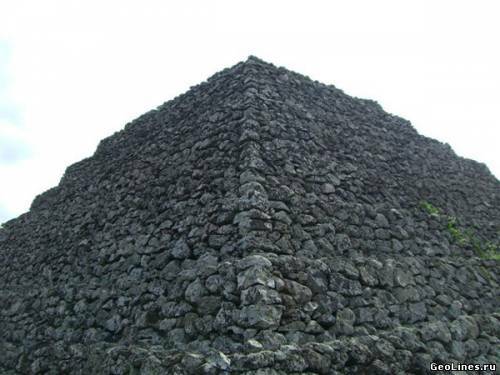 It was known in the beginning of 20th century about pyramids on Mauritius . But to the wide public they became known in 2008 after some expeditions visited them.The basic researches were made by Antoine Gigal with the group of archeologists. 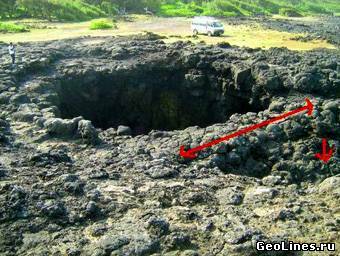 They have found some more pyramids which have been semi-filled up with the earth. And the rests of the other cyclopean constructions. By different estimations of scientists age pyramids can be 10000-20000. 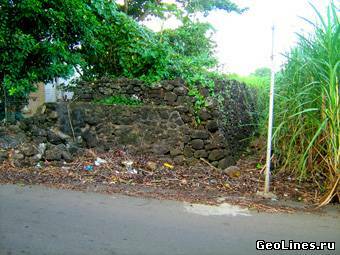 In 1502 Italian Alberto Kantino has plotted for the first time an island Mauritius and in 1507 the first Portuguese seamen visited it. There is an assumption that in 10 century the Arabian seafarers could know about island existence. 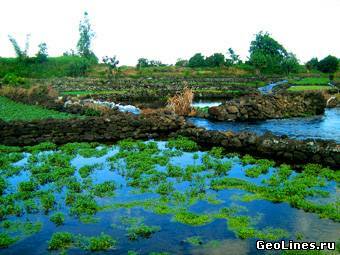 Later Mascarene Islands they named Dina Margabin, Dina Harobi and Dina Morare (accordingly Reunion, Mauritius and Rodriguez). 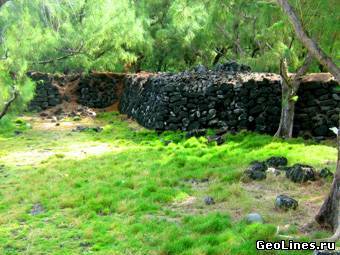 Theoretically about Mauritius could know the ancient Phoenicians the fearless people making distant sea expeditions. Peripl tells the story of Hanno the Carthago seafarer living in 5 century BC, whose vessels having passed strait of Gibraltar, have gone to study the African coast of Atlantic ocean. Herodotus describes the Phoenician expedition which left Red sea and bypassing «the sea to the south», following to the order of Egyptian Pharaoh Neho II (610-595 BC), entered back Mediterranean sea through a Gibraltar strait. It means that expedition bypassed round Africa. Well-known Norwegian seafarer Tur Hejerdal asserted that our far ancestors were able to orientate well in the ocean and organise the various expeditions, to prove his rightness Hejerdal found Maldives pyramid, in height of 8.5 metres strictly focused with the sun. 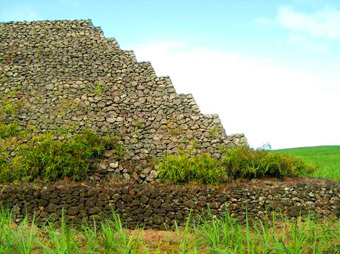 With opening of identical complexes of pyramids on Tenerife, on Sicily and now on Mauritius, it became clear that we deal with an unknown civilisation, which left traces on islands on the different sides of the African continent. Anyhow, but at the moment of the opening in the beginning of XVI century by Portugueses Mauritius was uninhabited. In 1598 the island was occupied by Dutches and received the name under the Latin form of a name of Moritz Oransky. Originally the island served only temporal moorilg for the trading ships. The first settlement of Dutches on an island appeared in 1638, and the first child born on island considers Simon van der Stel. 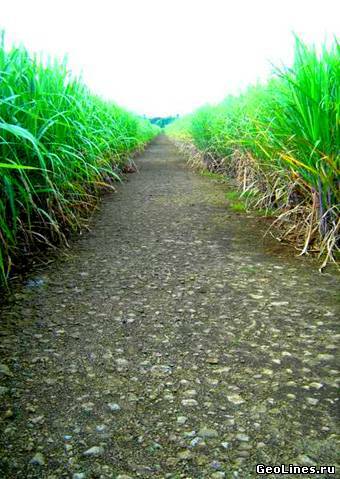 Gradually on Mauritius plantations of the sugar reed , cotton, tobacco began to create and to ranch the cattle. Slaves were delivered from Madagascar with this purpose. Pyramids are located as a compact group in the middle of deserted fields, in 10 minutes drivings from the airport. To these pyramids do not carry tourists , there is no mention in guidebooks about them , in films about island, nothing tells about pyramids too. Local residents also especially do not spread on this theme. First the country government has appropriated the security status to pyramids which subsequently they have practically lost. It is connected with government change in 1968 as result Mauritius has ceased to be the British colony. 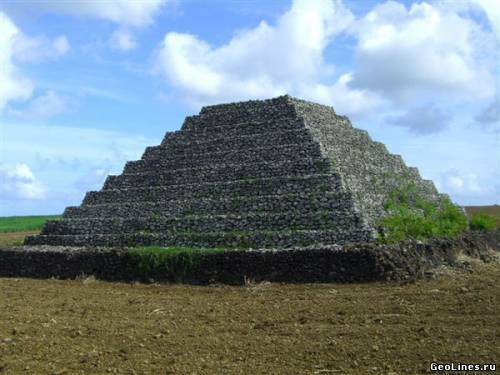 Now some researchers, assert that pyramids are not pyramids at all but heaps of stones which were combined by local peasants, clearing away fields under the sugar reed. 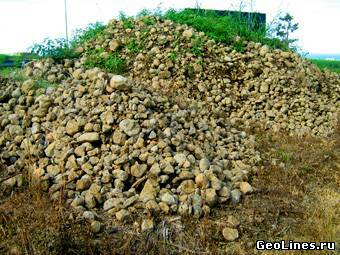 But to combine such "heap" it is required to have the engineering project, 30 000 tons of stones and enough of workers. Here it would be desirable to remember words from a known song: «But we know that this the island is uninhabited ». To combine one such"heap"to 100 men mustcontinuously to work not less than 5 years. Certainly, the version about a heap of stones is completely absurd, especially from the point of view engineers and geologists. Accuracy of corners and the base lines created from raw stone is well visible even from space. Undoubtedly, this is the work of skilled architects, but not one of slaves clearing away plantations. On the other hand what was for to collect all "heaps" in one place? 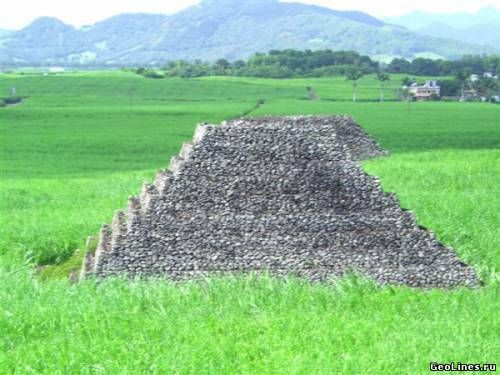 For humidity maintenance on fields people say which are not able to believe that pyramids have been constructed before opening the island. 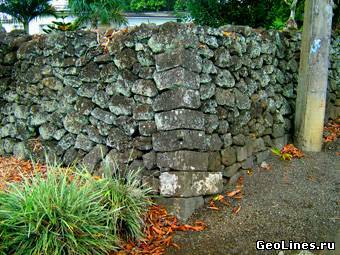 Heaps from the stones really exist in many places on Mauritius, but they look absolutely differently. Quite recently pyramids inspected Sam Semir Osmanagich, who found Bosnian pyramids. After the expedition he supported Antoine Gigal and he inclines to consider that pyramids of Mauritius have an ancient origin. It is clear that assignment of status to the pyramids «the heap of stones» will allow not to withdraw surrounding soils from the agricultural turn to correspond to the certain rules shown to archaeological monuments being under protection. It is necessary to hope that the government will understand economic gains from tourism also will appropriate status to the pyramids the of objects having historical value, which, by the way, some pyramids of Mauritius, formally have not lost till now. It would allow to continue researches and to preserve constructions. Pyramids on Mauritius island have an accurate squared shape of the basis and stepped borders. Quantity of steps is different from 6 to 13. Height of pyramids does not exceed 12 metres. The largest is the pyramid with width of the basis 26 by 26 metres. 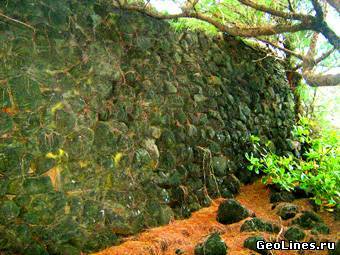 Also as on Tenerife, pyramids of Mauritius are combined from raw volcanic stone without use of a solution or others binding substances. These are difficult enough engineering constructions demanding from builders big knowledge and skill. They are also a complex part ,when series from several pyramids are grouped in one place. Near the basis of one of pyramids under partially destroyed laying, it is possible to see the calcareous base blocks, undoubtedly, coral origin. 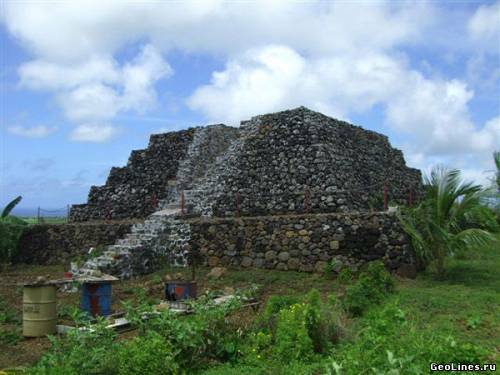 Some of Mauritius pyramids have a platform on the top which possibly was used for astronomical supervision. One of the pyramids has even a central ladder for access to the top. Passage is made from a few more light stone thanks to it is well noticeable. 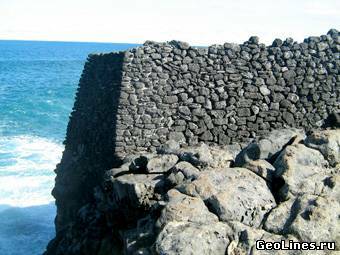 Besides, as well as on Tenerife not all pyramids have such passage, but where it is on both islands it is on the same level. 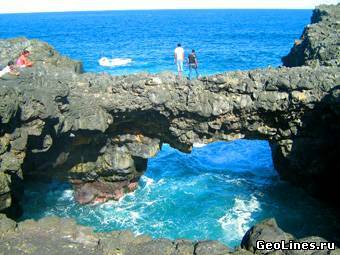 One more amazing circumstance, probably, connects a complex of Guimar on Tenerife with pyramids of Mauritius. It is known that on one of Guimar pyramids in the day of summer solstice it is possible to observe the unusual phenomenon - a double sunset of the sun which at first sets down behind the nearby mountain tops then again appears on horizon and again sets down. 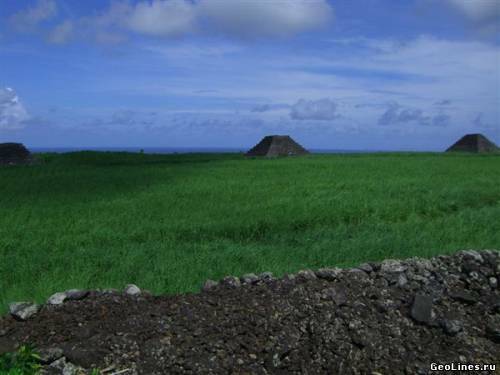 The preliminary, calculations which scientists are going to check up in the nearest time show that the same phenomenon should be observed also on a pyramid №2 Mauritiuss. In the day of summer solstice, which comes in southern hemisphere on December, 21st, the first sunset will be behind a Creole mountain, and the second behind the next Puma. If you compare photos of Tenerife and Mauritius pyramids and you outwardly do not define which of them is which. Such quantity of coincidence says that between islands there is a generality lying outside of accident. In immediate proximity from pyramid on a site about two square kilometres expedition Antoine Gigal has found also other impressive constructions connected with a complex of pyramids. The huge stone walls ,paved and planned roads, террасные the hydraulic systems created from the same material, with the same technology, undoubtedly, belong to the same epoch, as pyramids, Antoine Gigal confirms. 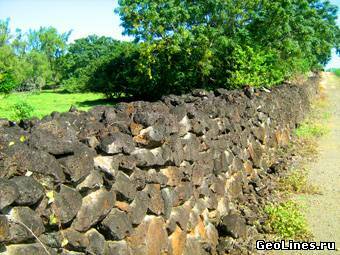 In vicinities of Plaine Magnien village there are massive stone walls constructed with special carefulness from the samt material as pyramids. In the top part the walls have width from 70 to 90 centimetres and height 1,5 - 2 metres, with more wide basis. In some places the width of the basis of the wall reaches 5 metres and consists of monoliths with volume about 2 cubic metre. 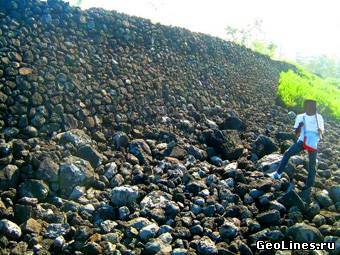 One of walls has length more than 600 metres last from pyramids №1 and №2 to the Mare d’Albert village. Other wall is erected directly on the brink of rock breaking in the sea and reminds observation area .To the north-east from this platform there are two more walls, which without finishing on ashore, go to the sea. The slope angle of the walls is close to slope angle of terraces of pyramids. Undoubtedly that walls and other constructions are parts of one ancient complex, and modern inhabitants as far as possible have simply adapted them for their needs. 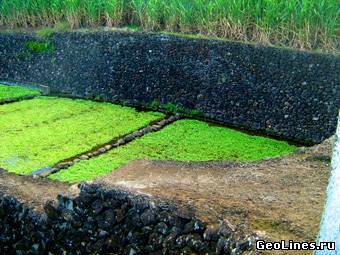 On Mauritius there are also ancient roads which connect pyramids and some other constructions. Roads are carefully planned, have the correct form and are made with such quality that the modern trucks which are passing on them several times in the day, do not cause any harm to them. Ancient roads sharply contrast with the modern road infrastructure of island which demands constant service and the big financial expenses. The width of roads fluctuates from 2 to 5 metres. 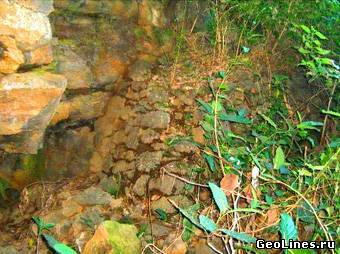 In some places the roadbed is raised over the surface of the earths for horizontal position preservation. The material from which roads are constructed is identical to the material of pyramids. One of roads in width from 5 to 10 metres begins directly at the complex of pyramids and without breaking more than 2 kilometres reaches the sea. Still to the south there are rests of huge hydraulic system which supplied with water a powerful underground source in the next valley. The system begins with the channel of the he first pool with depth about two metres which bottom is laid out by the flat stone plates. Other pool has the sizes 100 х 26 metres and depth nearby six metres. The pool is limited with massive walls identical to characteristics to the walls of pyramids. Nearby, on the South side of a beach Bushon there is a platform towering on 30 metres. The platform consists of a huge wall in height of four metres and in width at the bases about 2 metres. In the bottom part the wall is enough sloping and it is easy to rise on it . All design reminds a body of snake, with a head - flat platform on the top. In a place under name Pont Naturel there are two unusual structures. One of them is an aperture in the rock having accurately squared shape. From one hand the aperture is limited with an arch, an arch hanging in 30 metres over ocean. Waves create pressure of air, which with the terrifying sounds heard far around, breaks through this aperture. 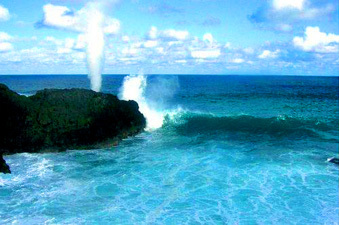 Another structure is sea geyser, located on the rock putting out in the sea and connected with coast narrow isthmus. In the rock there is an aperture, and ocean waves under it create pressure which is throwing out water on height up to 40 metres. 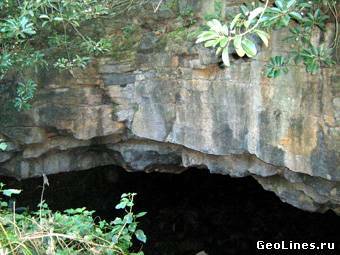 On Mauritius there are some caves in which remains of animals have been found and traces of activity of men. One of them, «a cave of swallows», has monumental entrance and huge internal cavity, in height of about 70 metres. The internal interior of this cave reminds artificial processing more, than simply lava streams. If to return to pyramids, in 50 metres from the pyramid №2 there is a small terrace, having risen on which it is possible to get on squared shape platform fenced in blocks. The platform and a terrace are made of the same a material, as the pyramid. But in the centre there is a sarcophagus made in modern style. 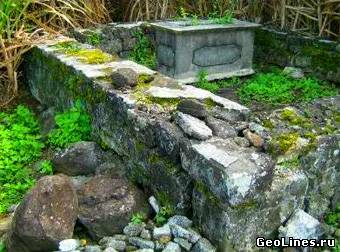 Local residents will tell to you, that it is a tomb of Mr. Kisuna. It is a pity that this person has gone to a better world, not Having informed, why he has wished to be buried in this place. 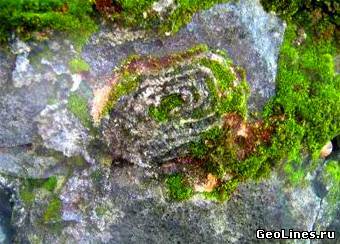 Nearby, on one of stones helicoid drawing is beaten out. Similar drawings are and in others island places. 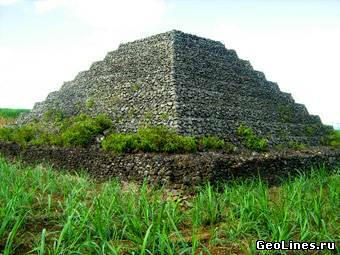 Complexes of pyramids on Sicily, Canary Islands, now and on Mauritius, similar as twins and brothers, testify that we deal with the unknown person seaworthy civilisation capable to create such constructions on the different parties of the African continent. At the moment it is not known about origin of pyramids, neither about the purpose of their building, nor about builders. Clearly one, pyramids have not been constructed neither Europeans in XVI-XIX centuries, nor Arabs X-XI centuries. But then whom?